Just wanted to drop you a short line to let you know my parcel arrived. It was wonderfully wrapped and the contents were in perfect condition. Is that it took 4 full days after that to travel the last 60 miles from Melbourne to my post office. Thanks for your incredible service. I received my long awaited engine parts and i could not be happier. Thank you very much for a straight forward and trouble free order. I have never purchased from overseas before and to be honest was a little uncertain as to the quality that i would receive, but wow was i surprised when i opened the package. I am actually a qualified land rover technician and have always recommended genuine to my customers, and purchasing your parts was a first for me and i can say it will not be the last. In my family there are 9 land rovers and if we can get quality parts like yours cheaper we will all be utilizing your business. Again thank you and i will be highly recommending your services. I just purchased a 300Tdi complete head from you guys , I must say what a professional buisness you run the service is none better and the postage time is out off this world . If you had a company in Australia you would be run off your feet. Wow 2 days to Melbourne from the uk the only let down was Australia Post it took 2 days from Melbourne Airport to travel 130 kays to my place . Thankyou very much for you professional service and another quality Turners product . I have ordered parts from UK on many occasions, this is the best service I have ever received. I am writing to let you know that how satisfied I am of your service! I received the goods from your company within two days after releasing the payment. I really appreciate your support and can only describle your service to be very professional and even magic! The packaging is perfect and all the components are supreme. I am very pleased of your service from consulting to shipment. Your staff are very professional and friendly. I believe that will be ordering your goods again soon and I definitely will recommond your company to all my friends. Thanks again for great service and such prompt delivery of V8 camshaft. 3 days exceeds my expectations by a verylong way! Order arrived today without damage and all items correct. Thanks to all. It is a pleasure to conduct business with your company. This is the second time I order 2.5 NAD engine spares off your company and I am impressed of the quality of your services. I am very grateful of your personal readyness to help in tech questions, it really helps to make a proper choice. For sure will advise my "landrover desease" mates to be also your clients. Thank you for such prompt delivery of the performance head and fitting kit.It took just four days to arrive. This is truly Platinum service and will recommend you to any Landy owners I meet who may require your help and advice. The head will be fitted over the christmas break and I am anticipating a new lease of life to my 300Tdi Discovery . I still can't believe that I ordered my cylinder head on Wednesday evening and received it Friday around noon. That's great, even better than my own country! Thanks again for all the help and fast service. I ordered that camshaft and followers from you after I received your answer (Friday 11th of November). Next Monday morning (Monday 14.th) the driver from DHL was outside my door whith the parts. The head arrived today, I can barely believe it only took 4 days to get here. Thanks once again for your incredible service. Both arrived already thanks Frida! Everything looks great. Just want to say Thank You to all of You that helped to deliver the Td5 head so quickly. I was totaly surprised, as my mechanic called me and announced that the head is there. If I look at the time stamps at FedEx, it took less than 20hours from ordering to delivering! Great Job and I wish everybody a nice weekend, like i will have in my Defender again! Thank you so much for the accuracy and speed of delivery! It had never happened before so quickly to get the parts to be much closer to my house! Received my head/rockers/gasket today via DHL. Looks good and fast shipping. Thanks for the great service! Should be back on the road by the end of the month. Head and bits received at Garage today, in Gosford NSW-Friday 11am, hopefully they will be as quick as your team. Ian - UK - 5th April 2011! I can confirm that the VAT refund has arrived in my account - thank you for facilitating that. I will certainly be using Turner Engineering again in the future and recommending to others that they use Turner Engineering. I received my 2.5 TD Short engine and it looks awsum!! Thank you for bringing light for my Land Rover. I also would like to send a big Thank You for all the Turner Engineering Team that made this possible. I would and will always recommend your services. Turner Engineering exceeded my expectations on professional and efficiency relation with customers. I am writing to say thank you for the smooth delivery of the spare parts that I recently ordered. All went to plan regarding their collection in York and getting them back to Zambia. I submitted the VAT reclaim form at Heathrow, which the customs officials duly stamped and stated they would be sending back to Turner Engineering to facilitate the refund. Just wanted to send a quick thanks. Received the 300tdi parts today. You put most aussie businesses to shame with your service. Pleased to confirm I have received the Package and all is in order. Thanks for the excellent service. Many thanks for your prompt delivery of my replacement cylinder head, it arrived at the garage the following day. If only their response time was as quick. very fast job & nice product! Just some quick feedback and an enquiry. The head ordered below arrived in an amazing 4 days. It has been fitted and performing very well to date. The difference is notable right across the torque band. Both my mechanic and myself are really impressed and feel the extra $ spent on the performance head was well worth it. Many thanks. Just a short note, I felt I had to write a few words of thanks for the service, very friendly and super efficient. Less than 24hrs from order to delivery despite the snow. If only more compnaies provided this level of service!! Just to let you know that I received the package and I was very satisfied with the whole experience of dealing with you. The package just arrived at 5pm NYC time. Perfect. You are fantastic! Thanks for rushing it through. I have just purchased the head and assembly kit that I have been harassing you about over the past few days and would like to take this opportunity to thank you sincerely for your timely help and assistance. You are the best, without any doubt. Thank you very much. Parcel was delivered half hour ago. So quick, without stress because of your help. Perfect service, I'm very happy. I just received the part today, im very thankful for your help , it was really good doing business with you and the shipping was very fast and on time, thank you. Must say I'm really impressed with the service you offer your customers, I allready received my package from the UK, meaning time from order completed to delivery less than 24 hrs! The defender runs great with your cyl.head and the other parts, now we have 1000km and the first service. I would like to thank you for your prompt and professional response to the parts I required to rebuild my 300Tdi. Also, I appreciate your help answering the technical questions regarding the overhaul. Your knowledge regarding shipping was also excellent. The engine rebuild is complete and the engine runs better than it did when new. I recommend your company to others here in the Landrover community. Thanks very much for sorting this out. This was the week before half term and there was a whole holiday come birthday party hanging on the availability of the LandRover. Coupled with your efficient service and Taunton LandRover you both did a splendid job of honouring your commitments. Very much appreciated. Taunton LandRover had not heard of you before, but without any prompting from me they commented on the quaility of the cylinder head and kit you supplied. The engine now feels a lot better and towed a 20ft twin axle van up the M6 complete with wife and 4 kids - with no effort at all - even though there is 100,000 on the clock. So once again thanks very much for your efforts and even though I spent a lot more on the repair than I ever thought - I do feel re-assured that I got value for money. I just received my 2.5D cylinder head. I cannot thank you enough and am absolutely blown away by the service I received from you. You responded to all of my emails within MINUTES, the price of the head was very very fair, and shipping overseas was unbelievably fast. Thank you for the last message in Dutch. Anyway, the Defender is now running better than it ever has (a new loom to the injectors helped). No longer the flat spots when accelerating. My mechanic was impressed with the quality and greater strength of the head. Once again thanks for your prompt attention and help. I would still be waiting for a replacement head here but for your help. Koekke Bakkers! I'd just like to say a big thank you for the service provided by you to me just the other day and also for the rather rapid delivery of the engine parts I ordered from you ( big end and main bearings and core plugs ). As ever Turner Engineering is top of my list whether its buying an engine, a head or a few parts - my experiences so far ! Good luck with the continued success of your business from a very satisfied customer over many miles and years. Just to let you know the parts arrived today, what a surprise. Can't thank you enough for the quality of the service. Such an easy transaction and everything appears to be right. Onward to the rebore now, the amazing thing is I ordered some parts from Adelaide the day before I ordered the parts from you and they still haven't arrived, how's that? I'll be in touch for the same order again as soon as I've finished this rebuild. Might be as early as late July, I'll be in touch. Fantastic service and so easy to deal with. Thank you. Everything has arrived and we should be firing up the beast tomorrow. Thanks again for the great turn around on my order and getting it here quickly! We have a club event (Ottawa Valley Land Rover - the oldest landy club in North America) and I will be sure to boast about your service. We get about 40 trucks out for our summer soltice event with the majority of them being Series. I would lilke to thank you all for the help and the great service I received from you all regarding the replacement cylinder head I ordered. I don't think I could have got better service anywhere else, especially at the speed next day delivery! Couldn't be better. I've just received my oil filter adapter. May I say a very big thank you, it's superb. Also thank you for such prompt and fast service. It comes as no surprise that Turner Engineering has such a good name. 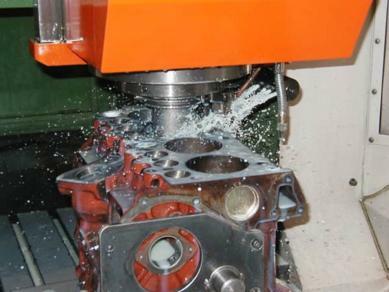 Just a quick email to say thank you very much for arranging the new cylinder head to be shipped to Peru. We collected our Landy a few weeks ago from the mechanic and the engine is purring like a kitten! It starts on the first turn better than it ever did before. Thought you may like to see a picture of him in action in the desert in Peru last week. I received my parts today and the car is fixed. Thanks so much for the prompt service. Hi, thanks for the prompt service, hopefully customs in Malawi will be just as efficient! Just a quick e-mail to thank you for the fast & efficient service you gave re the supply of a new cylinder head for my Discovery td5, Arrived next day approximately 24hrs from phone call to order. Wish all companies where as good as yours!